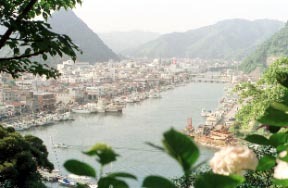 [Mountain climbing and sightseeing] A rice plant Ozawa river and Yoshi are a deep pool and the Shimoda aerial ropeway, and the Shimoda park, a perry load, the aquarium in the Shimoda sea, Shirahama and the Tago seashore. 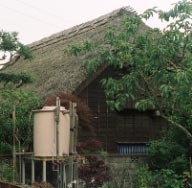 The hot spring with abundant hot water quantity which wells ups at the greatest tourist resort in Minamiizu, and the base of a mountain which went into the kita about 3 km from Shimoda.Although it is along a back highway, it is an enough in nature peaceful on the back about a hill at the back.The pleasure of various seamounts is possible at the touch which called it the sweetfish and the trout on the flow rice plant Ozawa river, and called the neighborhood sea fishing in the mouth of a river in a bora and the sea.It plays in the sea and can call it a capital position for feeling refreshed in a mountain.At Taisho's time, the Issen-yu that a bath has been taken for 1 sen is used as the isolated lodge of a kouchi, and two charter baths of a Kanaya Ryokan still now, the "Sennin-buro" which became the wooden bath structure of the national constituency rather than having called it the have good reputation of Shimoda after that is built, and the hot spring of the optimum temperature is overflowing in large quantities a long time ago.The pleasure of the maximum [ seafood / in which the hot spring was also landed with last thing in the Shimoda port / fresh ]. Kanaya Ryokan Pouring gate only for a woman "Manyouno-yu"
From the Shimoda park to the Shimoda portA kouchi is a recess of a mountain of the left back. 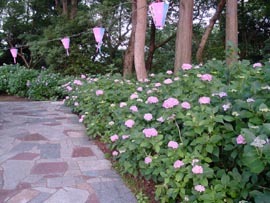 A June and the hydrangea of 3 million flowers seem to be bloom-magnificently mazes. Otherwise, they are a skin disease, motor dysfunction, rheumatism, the neuroparalysis, neurosis, recovery from fatigue, a chronic digestive disease, etc. Shimoda station -> taxi 6 minutes, 3 km.